Uncertainties attend the predictions of climate science, as the scientists themselves are careful to acknowledge. Reluctant policy makers use this uncertainty to support a “wait and see” response to climate change. 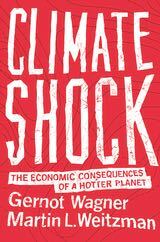 Prominent American economists Gernot Wagner and Martin Weitzman in their recent book Climate Shock: The Economic Consequences of a Hotter Planet are scathing in their condemnation of such a response. They translate “wait and see” as “give up and fold” and call it wilful blindness. Their own response to the uncertainty surrounding climate predictions is to ask what the worst case scenario looks like. Here’s what you get: about a 10 percent chance of eventual temperatures exceeding 6 ° C, unless the world acts much more decisively than it has. This isn’t a figure they’ve made up for themselves. It’s based on IPCC prediction ranges and on the International Energy Agency’s interpretation of current government commitments. It’s clearly a catastrophic scenario, but with a 10 percent chance of happening it must play a prominent part in our thinking and planning. We take out fire insurance on our homes with a much lower than 10 percent chance of their burning down. It’s called prudence, and most of us don’t think twice about the precaution of insurance. The book urges a level of response appropriate to an existential planetary risk of catastrophic proportions. There’s no blueprint in the lively discussion about what might be done and why it is proving so difficult to do it, but a price on carbon is one of the essentials, a point repeated many times over in the course of the book. What price? The authors see an appropriate price is one which prevents us getting anywhere close to 6 degrees warming, and offer $40 per ton as a start, the figure the US government estimates for the social cost of carbon. But it’s only a starting point. There are many obstacles to effective action on climate change. The temptation to free riding is ever present and often succumbed to. It’s at the heart of the global problem of global warming. Incurring costs which result in common benefit doesn’t come easy to most of us. I reflected at this point in my reading of the book that one only has to listen to the evasive words of ministers in the New Zealand government to be aware of how strong the impulse to free riding is. Apparently we are excused from putting a strong brake on emissions because we would lose competitive advantage if we did so; we can continue to explore for more oil and gas because there could be money in it for us; we can overlook agricultural emissions because we are producing food for the world; in the last resort we are too small to make any difference to the overall picture and in any case we’re only doing what everyone else is. So yes, we’d like to see global emissions come down, but we’ll certainly not offer anything that might be construed as a lead. But if free riding allows atmospheric carbon to rise to the point where the consequences are causing major damage the authors point to the dangers of a different phenomenon – what they call free driving. Geoengineering by countries desperate to ameliorate warming is the scenario the authors fear. It would be comparatively cheap and straightforward to inject large quantities of sulphur-based particles into the stratosphere and produce a cooling effect. Their book includes an extensive discussion of this type of geoengineering, not advocating it, but finding it difficult to see it being rejected under extreme circumstances. What the authors do advocate is international discussion and an attempt to establish international consensus in advance which would prevent rogue action. The seriousness with which they consider geoengineering is a measure of the seriousness with which they estimate the future risk of warming. More immediately and positively the authors argue for careful and limited subsidies for low-carbon technologies particularly at the early innovation stages of learning-by-doing. They envisage short term subsidies to enable new technology to get over the initial hump between expensive early production and much cheaper later mass production. They warn of the trap of long-term subsidies, nowhere better illustrated than in the $500 billion global fossil fuel subsidies. We see it as our obligation to paint the full picture of what we know, and to show how what we don’t know might play out. We take no satisfaction in doing so. We can only hope that we are wrong. Wrong on three counts: because the most drastic outcomes the science points to don’t come to pass; because society really does do what is necessary to rein in emissions; because the seemingly unstoppable drive to geo-engineering can be put under some governing mechanism. No doubt readers will share the hope that the authors are wrong. But for the present they do a valuable service in underlining to a strangely heedless society that we really are facing terrible human danger and need to take drastic action if we’re to avert it.